The recycled construction aggregates market is highly fragmented in nature, with large presence of regional and local players who provide solutions in a particular geographic area. 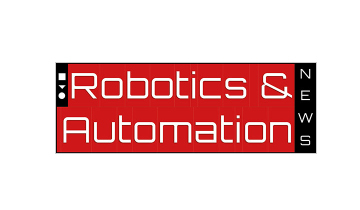 Considering the nature of the industry, with not too stringent technology and capital requirements, the market has seen the foray of emerging players and new market entrants. The industry is also regulated by environmental laws that varies from region to region. Established players have a significant presence in developed regions with a strong compliance policy, whereas mid-sized and new players in emerging countries continue to seek services to aid them in remaining compliant with regulations. Some notable developments in the recycled construction aggregates market have been listed below. CEMEX will deliver around 55,000 cubic yards of ready-mix concrete for phase one of the Plaza Coral Gables, which is likely to be completed by 2020. CEMEX is also expected to supply more than 170 thousand cubic meters of hydraulic concrete for 50 Km of La Gloria-San Fernando stretch main commercial route between Mexico and the United States. LafargeHolcim has been awarded infrastructure contract by British Columbia Ministry of Transportation and Infrastructure of over CAD 100 million for a major highway improvement project in Vancouver, Canada. 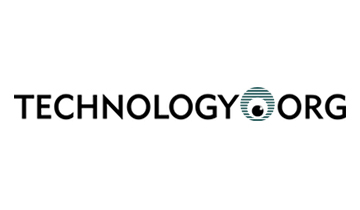 LafargeHolcim also acquired Metro Mix, LCC - the provider of ready-mix concrete in Colorado. Vulcan Materials Company acquired Aggregates USA, LCC. The acquisition includes sixteen rail distribution yard in South Carolina, Florida, and Georgia, and three granite quarries in Georgia. Tarmac is expected to create new cycling and walking connections in Cambridge. The company will deliver first phase of the Abby Chesterton Bridge and Chisholm Trail for pedestrians and cyclist to travel off-road across Cambridge. CRH acquired Ash Grove Cement Company, located in Overland Park, Kansas, US for total consideration of US$ 3.5 billion. The report offers detailed profiles of all the leading players in the recycled construction aggregates market. Some of the major companies operating in the market are Delta Sand & Gravel Co., HeidelbergCement AG, Aggregate Industries Management, Inc., Green Stone Materials, CEMEX, Vulcan Materials Company, CESPA, LafargeHolcim Ltd., CRH Plc., and Tarmac. Rapid urbanization, and proliferation in construction and infrastructure development activities allude significant amount of waste being generated worldwide, which has been a key environment concern among industrialists. Continued emphasis on the environmental conservation has further instigated the critical need for recycling and reusing construction materials. According to the European Commission, construction and demolition waste account for nearly 25%-30% of the waste generated in the EU. Estimations from the US Environmental Protection Agency (EPA) state that, in 2015, around 548 million tons of construction and demolition debris was generated in the US. Significant efforts are being taken by governments in countries such as the US, the Netherlands, and Germany, apropos of construction and demolition waste recycling and reuse. Introduction of new standards by the EU for recycling and reuse of construction and demolition waste in drainage, building, roads, and other construction projects, has further created growth opportunities for the recycled construction aggregates market. Fact.MR’s study offers incisive insights on the recycled construction aggregates market. A summary of the report is available upon request. Recycled construction aggregates continue to witness robust demand in line with growth of the residential construction and infrastructure development projects worldwide. According to the Global Construction 2030, published by Global Construction Perspectives and Oxford Economics, the worldwide construction output is likely to reach $15.5 trillion by 2030, with US, China, and India accounting 57% of the global growth. Governments in developing countries are introducing a wide range of housing schemes and residential programs, which has created demand for cost-effective, recycled construction aggregates. Additionally, road construction activities have significantly contributed to natural resource depletion, which has necessitated adoption of recycled construction aggregates in the area. 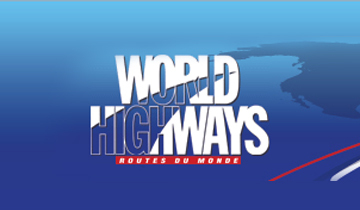 Major highway projects are underway in many countries to provide better connectivity, creating opportunities for business. Old building and bridges are being increasingly demolished in Europe, owing to the structural deterioration beyond repairs. Hence, recycling of demolition waste is emerging as a feasible solution in new construction after demolition of old structures. EU under the Waste Framework Directive aims to recycle around 70% of construction and demolition waste by 2020. Recycled construction aggregates are emerging as an effective alternative to the conventional sources, with the use of recycled construction aggregates becoming a prominent trend in developed regions. However, lack of initiatives by governments in the developing countries such as China, Africa, and India is expected to remain a longstanding challenge, hampering the growth of recycled construction aggregates market. The impact of construction and demolition waste is becoming a major issue in developing regions, in parallel to the rapid urbanization. The government interventions including policies for waste management is still in limbo in some of the developing countries. Compared to pace of urbanization in developing countries, the measures for construction and demolition waste management are sluggish. Additionally, lower affordability of recycling and reuse of construction aggregates, coupled with slower penetration of construction waste such as broken bricks and concrete, will continue to remain key challenges to growth of the recycled construction aggregates in developing economies. Recycled construction aggregates are the materials that are developed by processing inorganic materials previously used in construction. Recycled construction aggregates involves removing and crushing existing aggregates into the materials of specific size and quality. Various types of recycled construction aggregates are sand & gravel, crushed stone, asphalt pavement debris, and cement concrete. The report on the recycled construction aggregates market provides market dynamics including trends, drivers, and challenges that are likely to influence the current market scenario and future status of the recycled construction aggregates market. The report offers in-depth analysis, key insights, historical data, and forecast on the recycled construction aggregates market. 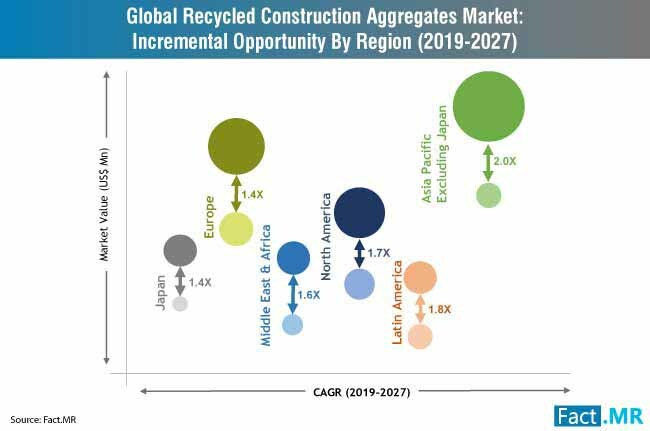 The report also highlights competition in the market and important factors that are shaping the overall growth in the recycled construction aggregates market. 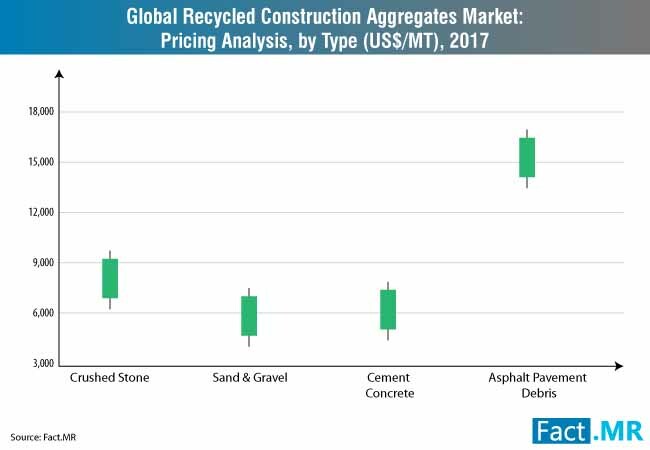 Region-wise and segment-wise analysis of the recycled construction aggregates market is also included in the report to provide better understanding and outlook of the market for the forecast period. The report provides details on each segment in the recycled construction aggregates market. The recycled construction aggregates market is segmented based on the type and end-use. 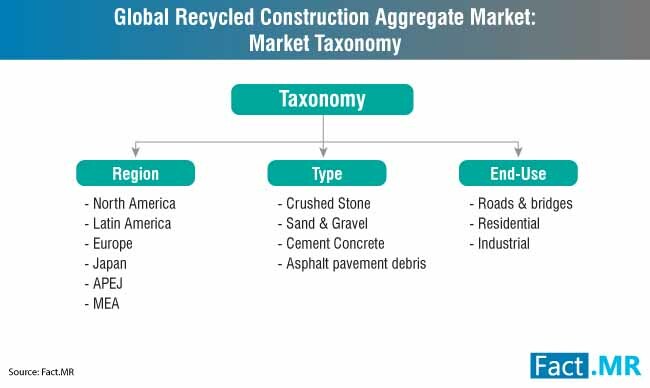 These segments are further bifurcated into sub-segments, to offers insights on the recycled construction aggregates market. On the basis of type, the recycled construction aggregates market is segmented into crushed stone, cement concrete, asphalt pavements debris, and sand & gravel. Based on the end-use, the recycled construction aggregates market is divided into residential, roads & bridges, and industrial. The report on the recycled construction aggregates market along with the in-depth analysis also provides answers to some of the important questions on the recycled construction aggregates market. What will be the revenue share of cement concrete in the recycled construction aggregates market? Which will be the most lucrative region in the recycled construction aggregates market? What will be the volume share of road & bridges in terms of the end-use of recycled construction aggregates? What factors are influencing the growth of recycled construction aggregates market? The report provides an in-depth analysis of the recycled construction aggregates market based on the extensive research methodology. The report has been developed with the help of data obtained during primary and secondary research. Interviews were conducted with the industry experts, distributors, manufacturers in the recycled construction aggregates market. The data and information collected during secondary research was cross-checked with the valid data sources and with insights from market experts. Bottom-up and top-down approaches has been used to develop the report. Research has also been done to offer historical data, forecast, and current scenario in the recycled construction aggregates market. 10.3.1. Aggregate Industries Management, Inc.
10.3.2. Delta Sand & Gravel Co.